Do you ever feel that your blogging comments are never the right length? Or that half of the skirt hem is hanging down and you don’t know what to do with it? Or that despite leaving the proper length of a skirt for a post, it feels like a choreographed Hallmark greeting? Have you ever felt that your comments didn’t make sense or were stupid? Much like writing a post, comments can be difficult and painful or they can be easy peasy. It depends on the contents of the post, the blogger, what others have already said, the gift of written gab, or if you have been overcome by Foggy Brain Syndrome. One might think I can comment easily after four years of blogging interaction, but that ain’t so. There are times I deeply struggle to find the right words and the correct length of the skirt so that I don’t sound dumb, or like a flowery Hallmark greeting, or repeat someone else’s comment, or go on and on and on about cats and football and bicycles. 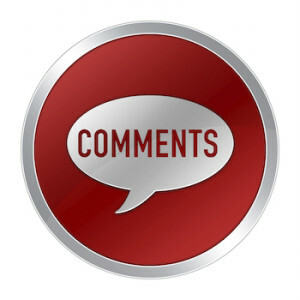 Do you ever hem and haw about comments? That being said, I have learned a few lessons over the years about commenting and comment etiquette that is important for all bloggers. It’s okay to leave short responses. It’s okay to provide long responses if you are answering a blogger’s questions about your favorite color, your favorite food, what you did today and the history of the world. It’s not okay to spam. Your comment will go in the spam folder and no one will never read or follow you. On the other hand, why do a favorite blogger’s comments end up in the spam folder? Huh, WordPress, can you answer that one? Check out a blogger’s “about” page or prior posts to get a better feel of who he or she is if this is your first time on the blog. That information may help you with an initial comment. I see that you are from Wisconsin too…hello neighbor! If a blogger is fairly new and you desire to get him/her connected with the WordPress family, you may want to suggest other blog sites, if appropriate. Be appropriate and respectful in all of your comments. A sad story requires some form of commentary hug, while a lighthearted or humorous story requires a commentary laugh. Don’t leave mean or derogatory comments! Blogging is supposed to be informative, fun and a way for people to positively connect. Don’t yell at me and don’t order me to go visit your blog. HEY! HOW’S IT GOING? I REALLY REALLY REALLY LIKE YOUR POST AND YOUR BLOG PAGE. COULD YOU DO ME A FAVOR AND CLICK ON THIS LINK THAT I’M ABOUT TO ADD SO THAT YOU WILL BE DIRECTED BACK TO MY BLOG WHERE THERE IS ONE POST AND IT’S NOT WELL-WRITTEN, BUT I THINK YOU SHOULD FOLLOW ME AND THEN I WILL FOLLOW YOU AND WE’LL BE BUDS FOREVER. Engage in conversation through your comments. If you leave a comment and a blogger responds, feel free to keep the discussion open. I’ve had some hilarious and interesting “talk” with fellow bloggers because I didn’t shut up after an initial comment. Remember, though, to cut it off before you become annoying. This post has been brought to you by blogging comments, skirts and etiquette. 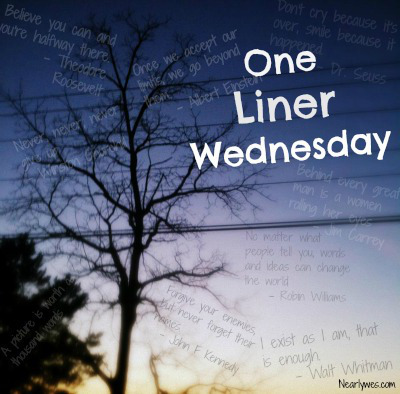 It’s also being brought to you by the fabulous Linda G. Hill’s One-Liner Wednesday. Click HERE to see additional one-liners in the comment section. Feel free to play along by posting your own one-liner and linking your post to Linda’s. And don’t forget to leave comments for Linda! Great post, good advice. Of course, I’m wondering which path you will take if a certain green and yellow team beats/loses to a certain black and yellow team. I know that I will talk the “I’m sorry…” route. You’re right. I’ve written enough, but I don’t feel I should end on that note. See what you started? For me, the first time I comment on a person’s blog is the hardest. Not to worry, Dan. My football comments will always be respectful toward the losing, non-green-and-gold team. I was going to give you early sympathy bonus points, but instead I’ll give you 100 “nice comment” points. PS: I see that your team drafted a star WI player in JJ Watt. It will be interesting to see what he does. I like that pick, and I really like that they snagged James Conner. That kid can run. It’s going to be an interesting year. Regardless of the outcome in November, I’m still hoping it’s only the first time we play each other this season. Ditto Dan. Another run for the Super Bowl, but first let’s enjoy summer! LOL, Marian! I agree with your comment and give you two footballs up, a gold star and 50 bonus points for good taste. I will accept that modest proviso! I’m trying to worry less anout everything. I have made some great connections through comments on the posts of other bloggers. It’s such a bug world. Mt favorite “game” while in traffic is wondering about the people in cars around me and marveling at the fact that thousands of us brush elbows each day. We all have hundreds if friends and acquaintances, family; and yet, the odds that any of us are connected is slim. That’s a LOT if people nit to know! There are millions of people we will never know, Cheryl. Then again, it’s so funny when you meet someone and find out they have a connection to someone else you know. Or I find out through Facebook that Friend A knows Friend B…which makes me want to know their story. Thanks for your comments, Cheryl. You’ll have me wondering about the others traveling to work this morning! I comment if the need strikes, and I must admit I try to keep it concise but some times the topic sends you over the edge with extra words. 🙂 My wish is that everyone had a ‘like’ button because I read every blog I subscribe to but don’t always have a comment. This is true Judy. I don’t always comment on posts. It depends on my time and whether the post elicits any comments. If I can’t come up with a comment within the first few minutes, I “like” and head out to the next one. A few times I’ve come back to a post and commented later. I agree with Judy. I wish every blog had a *like* button too. Sometimes I really don’t have anything to say – or I’m just too brain-dead to form a coherent sentence, and an emoticon won’t cut it. I like the quote though – it sums up the art of commenting perfectly. Some people seem so good and effortless at it while most of the time I struggle … like making small talk at a party. Exactly Joanne! I really worry about sounding like a Hallmark card when I make comments. It’s like writing in a sympathy card and trying not to sound like the card itself. I guess we just do the best we can and try to keep connections with other bloggers. Let me say that I always look forward to your comments, no matter the struggle or ease in them. The bottom line is that we all love comments whether they’re short, long, flowery or otherwise. Engaging in this virtual conversation is the best part of blogging and I don’t understand those bloggers who don’t respond to comments. In my opinion, they’re missing the point. Having said that, I’ve learned something about bloggers on Blogspot. Most of the time I don’t get notification of their responses. I always assumed they didn’t respond and discovered otherwise by accident. I’ve reported it to certain blog owners, but sometimes they just can’t figure out why. Joanne, I would continue to engage you in conversation, but work and a meeting are calling my name. Talk later! Calm down, Maggie. These are unofficial, suggestive, encouraging comments about comments. Ha! You get 50 bonus points for being a rule breaker, but not yelling at me. Thanks! All the time. All. Of. The. Freakin’. Time. I try not to worry so much, but then I go and make some stupid mistake, and you can’t edit comments! (unless I’m missing something) which could be a good thing. If you could edit comments, I might be at it all day. Haha! I love reading other comments. This was fun! End of comment. So do I, Lois. Thanks for commenting! I sometimes leave short comments, sometimes only replying with emojis, sometimes I get wordy. I dunno, I do what I want. BUT I do try to be positive and polite, which I wish all people would. I certainly enjoy reading comments pretty much everywhere. I think “Don’t try to comment without reading” would be another nice suggestion. People sometimes… uh.. wing it? And that goes badly at times. I feel embarrassed when I see it. I always remember a VanHalen concert I went to in Southeastern Wisconsin. Sammy Hagar was the lead singer at the time. He yelled out to the crowed, “Hello Chicago!” Oh man, you don’t do that in Wisconsin. Fortunately for him, the show was great and I think everyone forgot about it after several more beers and songs. That always stuck in my head to know where you are and who you are talking to. So I always try to find out more about the blogger before saying something stupid. These are wise, wise words. Knowing your audience is crucial. I really like your rating system. I could use that kind of feedback because some of my stories (posts) are pretty HD and R (you have to be a certain age to know that means Heavy, Deep and Real) and I have no idea how these stories sit with people. Anyway, great Blogger feedback and advice today. Thanks. Thanks for your lovely comments. I did not know what HD&R was, so thanks for that educational piece. I’ll try to get by your blog soon for some feedback. That is the other piece I could write about blogging – finding the time to keep up with all of your blogging friends. I appreciate your visits and comments greatly! 😀 Delightful post, Mary. And I love that quote. Mega hugs. Hugs back to you, Teagan, and thanks for your comment! Keep rowing, Linda. You’re in the same commenting boat as the rest of us. Excellent advice. I don’t always leave comments, even though I love to get them. Sometimes, I just don’t know what to say! Sometimes, I’m having a day when I feel stupid, and I’m afraid a comment will reveal it. So far, I haven’t had any mean comments on my blog. I suppose that will happen some day, and it’ll make me cry. Or cuss, depending on my mood. Isn’t it great to get comments? It’s much more engaging than pressing “like” buttons, but I understand about not wanting to comment on a bad day. I used to moderate comments for fear of the trolls, but I haven’t had too many issues. I found not moderating made it easy to continue back-and-forth discussions in real time and lots of fun! I guess it’s normal that I’m feeling very shy about writing a comment about this post… …especially as it’s my first visit to your blog. So I’ll just to say I’m glad I bumped into your blog and leave it at that before I bore you. Thank you so much for visiting, commenting and following my blog. I truly appreciate it. Come back any time and you are most welcome to leave comments.